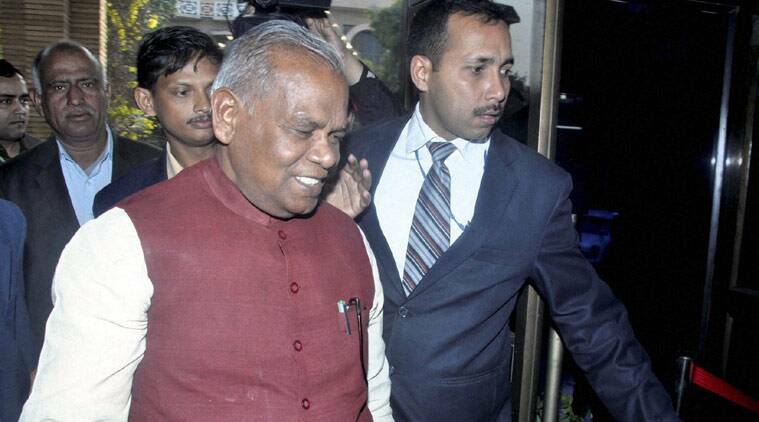 Manjhi announced that HAM would contest alone all the 243 seats in coming Bihar polls. Expelled JD(U) leader and former Chief Minister Jitan Ram Manjhi on Friday announced launching of a new party “Hindustani Awam Morcha” (HAM) which he said would contest alone all the 243 seats in coming Bihar polls. Manjhi announced launching of the new party at a press conference in Patna. He named former Bihar minister Shakuni Chaudhary as Bihar President of the HAM. But, neither Manjhi nor 17 others rebel JD(U) MLAs name figure in the list of the new party for technical reasons. “We will soon approach the Election Commission for registration of the new party HAM with a flag (green on top and bottom while middle portion will be white with the word HAM),” Manjhi flanked by Shakuni Chaudhary and two rebel JD(U) MLAs Nitish Mishra and Anil Kumar, told reporters. which was on Friday given the shape of a political party by him. Manjhi and his supporting MLAs had earlier claimed that once merger of splinter parties into Janata Parivar was completed and JD(U) leaves its Arrow symbol they would claim it by remaining in the JD(U) itself. But, the process of merger and decision on new symbol and flag of the unified Janata party taking time, Manjhi and supporters on Friday decided to launch a new party with the name HAM with a new flag. Manjhi said the new party would field candidate on all 243 seats in the coming Bihar election. Names of 108 leaders were announced in the Bihar unit of the party. It comprises former Union minister Devendra Prasad Yadav, ex-MP Brahamdeo Anand Paswan and former state ministers and Legislators like Ganesh Yadav, Ram Kumar Yadav, Om Prakash Paswan, K D Yadav and Ramchandra Prasad Singh. Manjhi spitted venom against his mentor Nitish Kumar and identified him as the new party’s “number one enemy”. On expelled RJD MP Rajesh Ranjan alias Pappu Yadav, Manjhi said he would welcome him if he decides to work with him.